“Invisalign” takes a modern approach to straightening teeth, Using a custom-made series of aligners created for you and only you. These aligner trays are made of smooth, comfortable and virtually invisible plastic that you simply wear over your teeth. Wearing the aligners will gradually and gently shift your Teeth into place, based on the exact movements your dentist or orthodontist plans out for you. There are no metal brackets to attach and no wires to tighten. You simply pop in a new set of aligners approximately every two weeks, until your treatment is complete and you achieve the confident smile that you’ve always wanted. The best part about the whole process is that most people won’t even know you’re straightening your teeth. Sure, there are other options out there for straightening your teeth, but none offers the level of comfort, convenience and confidence that you´ll find with invisalign. And no matter what stage you’re at in life, you´ll appreciate how our cutting-age approach to treatment has minimal interference in how you live, but has significant positive impact on how you look and feel about yourself. Making the decision to straighten your teeth is much easier when you know that Invisalign is flexible enough to let you live your life the way you want to. With Invisalign, you don’t need to worry about the gum and mouth irritation other teeth-strightening methods can cause. 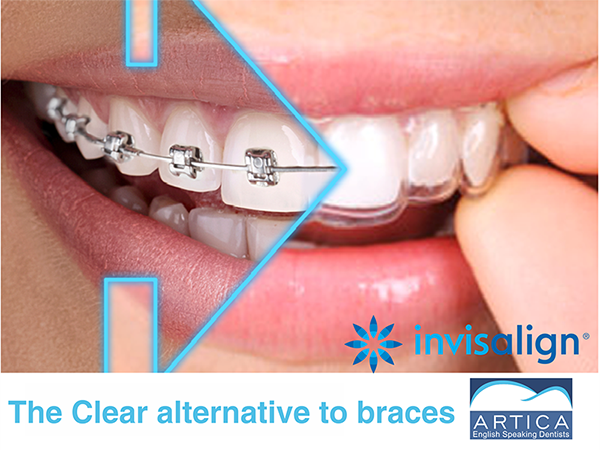 With invisalign, the aligner trays are not only smooth and comfortable to wear, but ther´re also removable. That means you can continue doing all the things you normally would, from brushing and flossing, to eating whatever you like. With other devices, brushing and flossing properly can often take up to 30 minutes. Swollen, red gums can often be the result of having teeth that are crowded or too widely spaced. Unfortunately, these are also signs of periodontal disease. When teeth are properly aligned, it helps the gums fit more securely around the teeth, allowing for the strongest and healthiest defense against potential periodontal problems. That´s where invisalign comes in. The comfortable and clear aligners gently and gradually begin to move your teeth into the proper position – without unsightly brackets and wires. One of the biggest challenges of having braces is removing all the food that gets trapped in the brackets and wires. This can often lead to plaque buildup and eventually tooth decay. With invisalign, the aligners are removable. So it´s easy to continue brushing and flossing your teeth the way you normally do. Think of you teeth as a “window” to the health of your body. Your teeth and gums – and how they look to others when you smile – say a lot about you overall health. If you´re taking good care of both, you’re probably taking good care of the rest of you. Tooth decay and gum disease are caused by bacteria. Left untreated, they can cause mouth sores, tender or bleeding gums, bad breath, and possible tooth loss. Studies by the “American Dental Association” have shown that oral infections can also lead to other more serious ailments such as heart disease, stroke, pneumonia, and diabetes. Invisalign aligners make daily oral hygiene easier, thus reducing the risk of possible problems, and correctly aligned teeth can also alleviate the issues that can be caused by an improper bite, speech or chewing difficulties, jaw problems, and increased wear on the tooth enamel. Invisalign effectively addresses all of these orthodontic issues, so you´ll have the confidence of a great smile and increase the likelihood of improved “oral health”.